Home-ownership is still the preferred housing tenure in the UK but has been in decline. 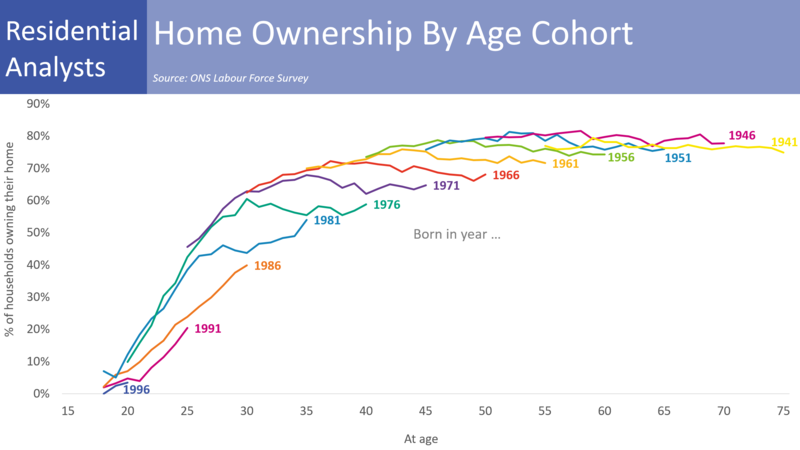 Analysis by age cohort shows how younger generations are struggling to achieve the aspiration of home-ownership. The analysis of the Labour Force Survey shows that only 40% of household heads born in 1986 owned their own home at the age of 30. This compares to 62% of household heads born in 1966 owning their own home at the age of 30. With fewer people able to buy their own home and social housing availability constrained, people are living in the private rented sector for longer. Only 7% of household heads born in 1956 lived in the private rented sector at the age of 40. 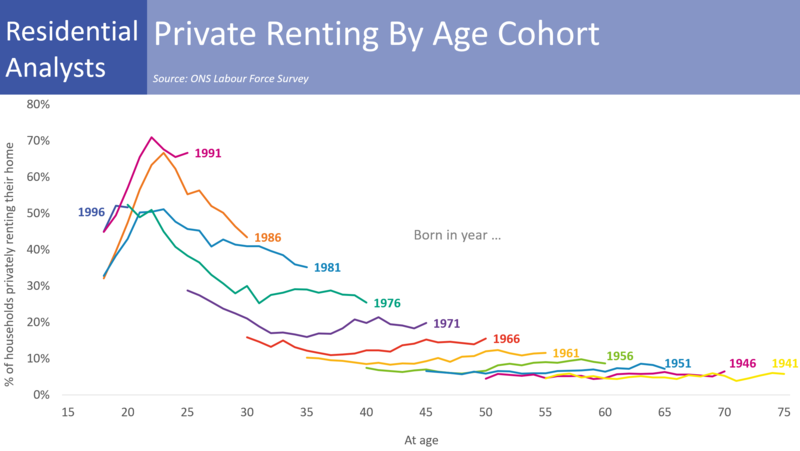 For those household heads born in 1976, around 25% lived in the private rented sector at the age of 40. The current trajectories of younger cohorts suggests that this figure will be even higher when they reach the age of 40. Large numbers of older people living in the private rented sector could create significant challenges for the future as pensions are increasingly relied on to cover the cost of private rents alongside other living costs. I have used the age of the head of the household for this analysis although there is also an argument to be made for running the analysis on a person basis given the large number of sharing and other mixed households living in the private rented sector. The home-ownership chart is slightly different to a previous one I published on Twitter last year. The previous chart used two years either side of the year born to remove any volatility whereas the one above only uses one year either side of the year born e.g. 1981 is an average of 1980, 1981 and 1982.